Not normally what I class as a “retail fixture,” nevertheless the “Anti Theft / Security” Category here on FixturesCloseUp should contain tips to this pilferage prevention strategy. This concept is a Safer Box Straight-Entry Hook implementation. 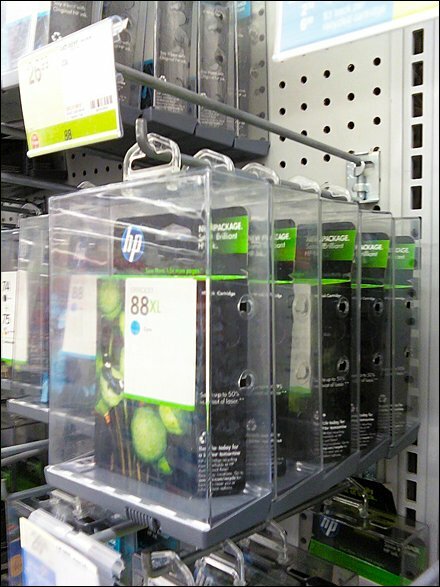 If there are various styles of Safer Boxes that deserve some discussion or coverage here, please educate me and I will keep a “weather eye open” for them on the selling floor. Note the use of Straight-Entry Flip Front Scan Hooks for this display. The Straight-Entry capability facilitate setup and re-planogramming of these bulky plastic cases. The Flip Front Label Holders swing up and out of the way as the boxy items are accessed. But Straight-Entry Hooks are easily removed along with the entire lane of product. Possible at detriment to anti-theft strategies.